Scouts is the largest youth movement in the world and we are proud to be part of it. Scouting is perhaps more relevant than ever today in that it encourages youth to be active and often outdoors. We are an active Scout Group, with Joeys (for 6 – 7 year olds), Cubs (8 – 10 year olds),Scouts (11 – 14 year olds) and Venturers Section (15 – 17). For more information about Scouts, you can view the information below or Contact Us. Scouting as a movement for boys was started by Lord Robert Baden-Powell after he returned from the epic siege of Mafikeng in the early years of last century to find the youth of the British Isles playing games which they were basing on his handbook for army scouts. He was persuaded to rewrite the book, renamed “Scouting for Boys’, and the Scouting movement was begun. Later, he used the jungle stories of Rudyard Kipling as a basis for the Wolf Cubs (now known as Cub Scouts) specially adapted for the needs and abilities of younger boys. These days the Scout Movement is by far the world’s largest youth organisation and in Australia there are five sections – Joey Scouts for ages 6 – 7, Cubs Scouts for ages 8 to 10 , Scouts for ages 11 to 14, Venturers for ages 15 to 17 and Rovers for ages 18 to 26. Scouting has spread right around the world and is currently active in over 216 countries with more than 40 million members. The Scout Promise has three fundamental parts – duty to your God, duty to your country and duty to other people. The World Scouting symbol of the fleur de lis is a reminder to scouts of these three parts.If your beliefs preclude your child from participating in any religious or patriotic activities e.g. saying a prayer or saluting the flag, then now is the time to bow out. However, we are not affiliated with any particular religion, nor is membership of any religion a prerequisite of joining the movement. Through our programmes, we seek to encourage in young people, attitudes which will stand them in good stead throughout the rest of their lives, such as initiative, self-reliance, responsibility, respect and consideration for others, with due regard for the level of development of the age group and of individuals. Originally a boys-only organisation, the Scout Movement has progressively expanded its programme to include girls. In 1990 the movement became one of mixed membership through all sections. A Scout group is the local area organisation that offers different levels of Scouting to various ages. 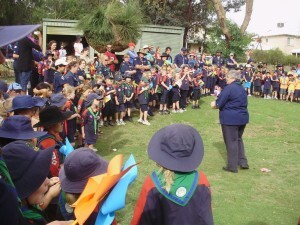 A full Group consists of a Joey Mob, a Cub Pack, a Scout Troop, a Venturer Unit and Rover Crew. The Group as a whole is managed by a person known as the Group Leader (GL). Each Mob, Pack, Troop or Unit is under the control of team of Leaders. Each section also relies strongly on the assistance of parents but in slightly different ways depending on the needs of the section. In Joeys, Cubs and Scouts, parents are needed to assist in the weekly activities and help on Camps. In all sections parents may be called on to assist with transport of personnel and equipment. If your child has been invited to join our Scout Group for the first three weeks he or she will be a ‘new chum’, and will be automatically covered by the Scout Association for insurance. After the initial three weeks, you child must decide definitely whether or not he or she wants to be a Joey/Cub Scout/Scout or Venturer. On the fourth week, or shortly after, we will invest your child into the Movement. Before this, you will be required to complete an M1 form registering him/her with the Scout Association of WA and pay registration fees. For more information about joining Cary Park Scouts, go to the New Members page.